This name derives from the Hebrew “adamah > 'âdâm > Adam", meaning: (Literally: the ground, the earth), (Figurative: man, being human), (Arabic: made from the earth, made from the mud). Adam is a figure in the Book of Genesis, the Quran and the Kitáb-i-Íqán. 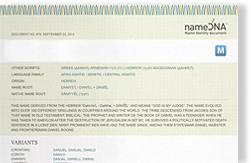 In the Genesis creation narratives, he was created by Yahweh-Elohim (Yahweh-God, the god of Israel), though the term "Adam" can refer to both the first individual person, as well as to the general creation of humankind. Christian churches differ on how they view Adam's subsequent behavior often called “the fall of man”. Linked to this root, the name “Addison” (son of Adam) was the 14th most common name for girls born in the United States in 2012. Adam is also a surname in many countries, although it is not as common in English as its derivative Adams (sometimes spelled Addams). In other languages there are similar surnames derived from Adam, such as Adamo, Adamov, Adamowicz, Adamski etc. According to United States Social Security card applications in 1984, the name Adam ranked 18th out of the top 100 names chosen by parents for their baby boys.